ObamaCare Survival Guide by Nick Tate. Book suggested for rating by Bert. This book gives a great overview of the major aspects of Obamacare. 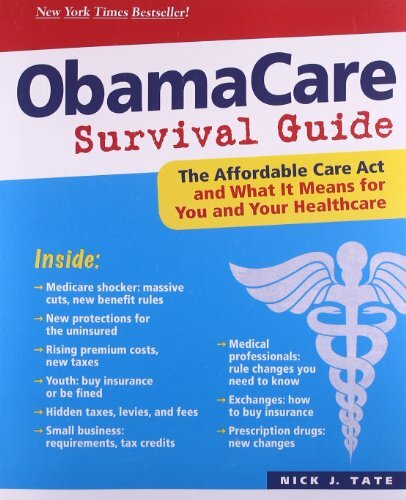 It is easy to read, full of good facts, and works as a good introduction to ObamaCare. It seems to be written with the goal of being very easy to understand as it is overly repetitive at times but it does help drive the point home. It focuses on what ObamaCare is and how the pieces of it that have been implemented have changed the health industry, not necessarily the consequences or morality of it. However, it does make some reasonable predictions (e.g., it doubted that Americans would be able to keep their current insurance plan ). I highly recommend it as an introduction to ObamaCare. How does it deal with the fact that there is no Obamacare law because the imperial president keeps rewriting it to be what he wants? The book does a decent job describing what the bill is on paper and if continued to be implemented as is, who it will benefit, who will suffer, and what issues could possibly arise. It does cover how much has already been revised which is interesting considering its not even half-way through the role-out period (the final pieces are suppose to go into effect January 2018). The book acknowledges its a changing law but tries to predict where the friction will arise forcing these revisions.